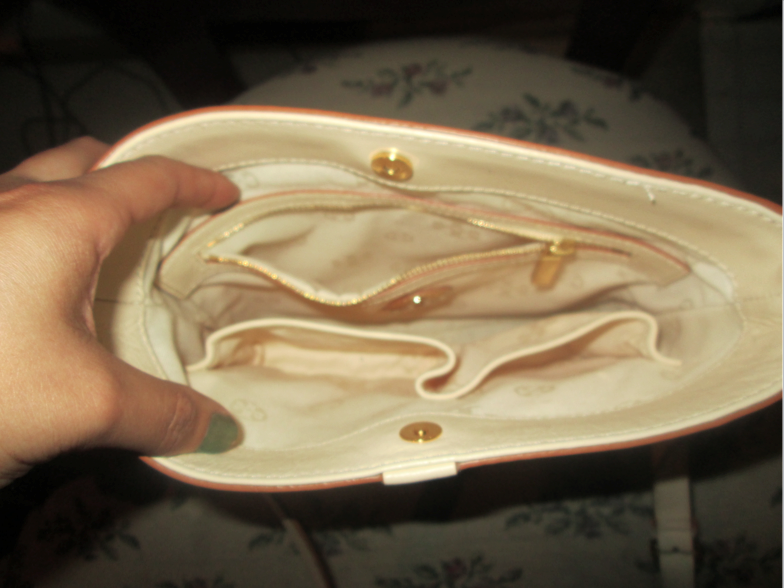 I wanted to do a haul/mini review over my new purse, the Holly Bookbag from Tory Burch. If you look back at an older post of mine, I had this bag on my wishlist. I told myself after I found a job, I would treat myself to a new crossbody since my other ones were basically falling apart. Months go by and I finally get a job, but then I decide to wait and treat myself for my birthday in July since I have other important expenses to take care of. Well, I didn't expect the bag to go on sale. By the time I even noticed the sale, the color I wanted was completely sold out. I was so devestated, but I refused to buy the bag in a different color. I knew what I wanted and I didn't want to settle, especially since the bag was going to be an expensive purchase. On my search for the perfect crossbody, I decided on a Kate Spade one. A few weeks ago I found one that I was ready to purchase on Ebay, but before I was about to buy it, something told me to check the Tory Burch website to see if anything had popped up in the sale section. I swear the purse gods must have been looking out for me because what did I find? My Tory Burch Holly Bookbag I've been wanting in the Vanilla Cream color. I don't think I could have entered my credit card information in the system any faster. What did this lesson teach me? To wait. Patience is key. Do not settle for something you're not crazy about, especially when you're paying a high price. HOLY MOLEY girls! I am in love with this bag! When I recieved my bag in the mail, I was so in love with it. From the reviews online I was expecting the bag to be small. To my surprise, It was a lot bigger than I had expected. 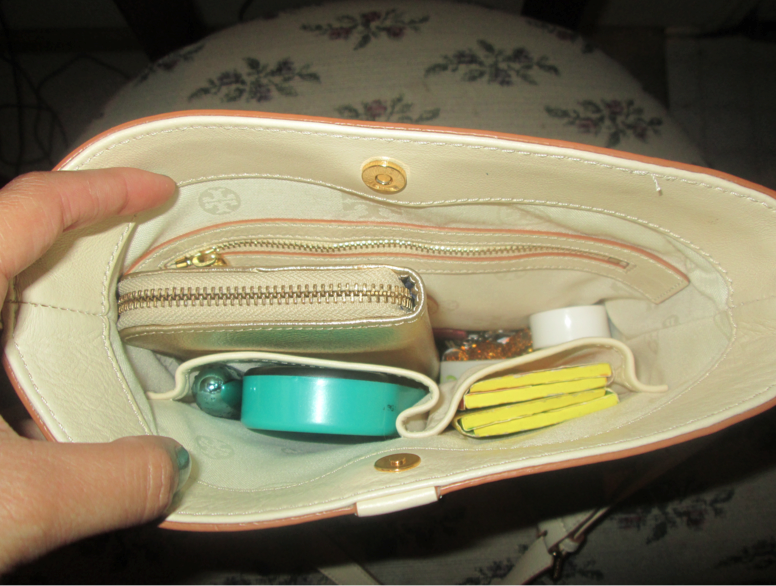 I can fit my chunky car keys, house key, some feminine products, a full sized wallet, gum and mints, a snack and essential lippies without stuffing my bag to where the magnet doesn't close. 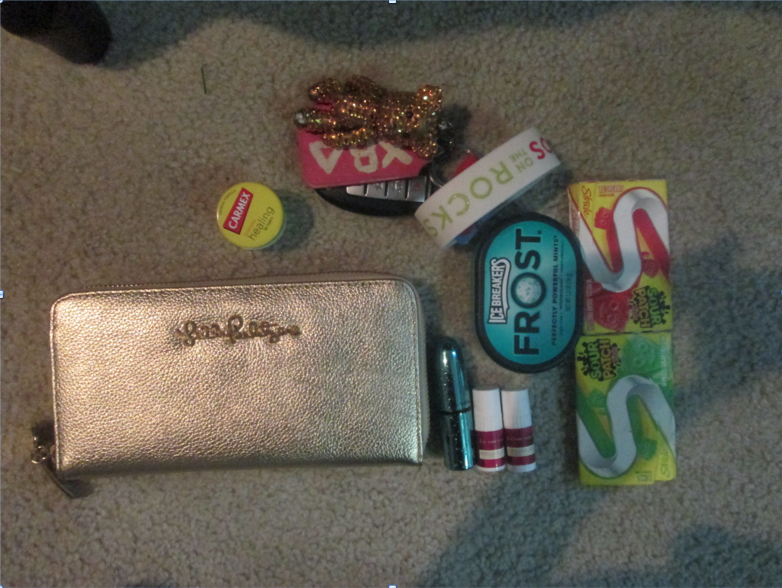 Most of the contents in my purse. Missing the lady products and a snack. Originally, I bought this bag as a replacement for all my other crossbodys. I wanted this to be my go-to purse when I didn't want to carry anything big, like when I got out for a night on the town. I feel like I can't do that with this purse because I feel like it is too nice. If someone ever happened to spill a sticky cocktail on my cream bag, I would probably have a fit. I was planning on getting a black monogramed crossbody that's a heck of a lot cheaper, so I guess that will eventually be my going out bag. Another thing I'm not really fond of with this bag is the fact that if you're wearing jeans, the dye WILL rub on the white leather. I mean I know this is expected with any light colored bag, but I'm pretty OCD whenever I have a new bag. I wore my bag this past Friday and I ended up getting little stains on it. From ONE day! I used a makeup wipe to get the little stain I had occuring out and I think it worked, but I know this won't be a perminent fix. I'm sure there's leather cleaner I'll be able to use when dye runs on it, so I'll just have to invest in some. Other than the bag not being practical for going out and dye from jeans transferring onto the leather, I am completely obsessed with the bag. Also, the fact that it was on sale and I got an extra 10 percent off makes it that much better. I feel like this purse is about to get a lot of love from me! What is your favorite go-to purse of the moment? Thank you so much for your sweet comment! :) I now follow you via GFC! :) Looking forward to reading more of your posts! I like this post,And I figure that they having a great time to peruse this post,they might take a decent site to make an information,thanks for sharing it to me .